It was an honor to present concepts discussed in this blog on Friday to the Nonprofit Commons in Second Life. A wide range of organizations were represented by their avatars in the central arena. There to discuss signage, I reviewed the best reviewed here and discussed tips and ideas for how they can improve their signage overall. Although most of the organizations, unfortunately, design their own signs, there are still ways that they can improve by following some basic considerations. Hopefully they will grow enough where they can afford to give their group a graphic face. The most important thing any organizational director can do in their SL presentation is to take a step back and try to put him or herself in the shoes of the visitor. How easy is it to see the signage? 1. Placement. It is better to have more smaller signs than a single large one. Many organizations place a sign above the door, causing the newly arrived avatar to have to look up. The first place to have a sign is where someone can see it at the landing point. Then, there needs to be one by the door. Finally, there needs to be one just inside. In NPC, it makes sense to also have one on the roof. 2. Clarity. Many signs are very hard to read. A good test is for how small it can be made and still be legible. Boldness in SL is very important because people move fast and look at images from a great range of distances and angles. Any image that doesn’t hold up misses an opportunity to grab. Visiting all of the organizations in NPC, evaluating what you do visually and in marketing, I also learn more about how you operate, meet expectations, and fulfill your missions. My fascination with business is equal to my fascination for virtual reality as a publishing medium. Like blogs, websites, wikis, etc., Second Life has a role to play in the suite of communication tools. But what makes it much more special are the collaborations, personal friendships, and international stage. 1. Make the sign big enough to read. If it can’t be seen from a short distance, it is too small. 2. Place the sign in a position where avatars can see it (and not have to scroll around to find it). 3. Place more than one sign around entrances. Coming from different directions for eyes looking at a variety of images are in a hurry and can miss single placments. 4. Put identity information at the bottom of information posters. So if a visitor does come inside without seeing the entrance signage, there is still the reinforcement with consistent identifiers. Yet as obvious as these principles may seem, why do so few organizations and presenters consider them? Fully one-half of the commerical places—from shops to nonprofits to art galleries to cafés—the visitor has to SEARCH for the identity of the location! Often they leave without knowing whom they just visited! Within a recreation of Chicago in the 1920s a backdrop for a role play sim,* the publication from that era has also been brought back to life: The Chicagoan magazine. Unfortunately this jazz-era publication only had the short life of nine years, yet captured the essence of the era’s culture and character. -Street signs hang just above head level so that avatars can easily see from down the street and when approaching. 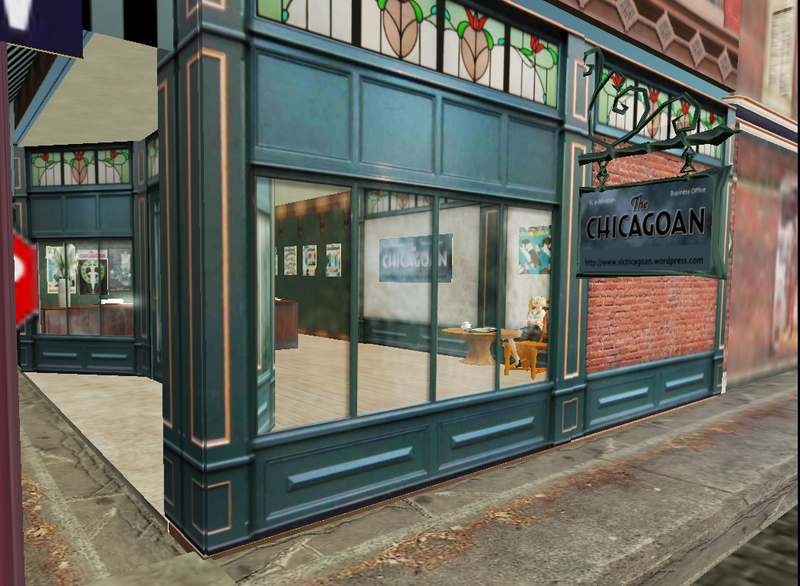 On a street corner of the recreated historic “Loop,” The SL Chicagoan magazine has an office—set up for visitors and as a distribution hub of the inworld publication** with links to the blog, is a collaboration of those writing historical fiction in a virtual setting. Magazine image hangs in the window. Large banner sign on the inside wall can be seen from the doors and through the windows of this corner space. 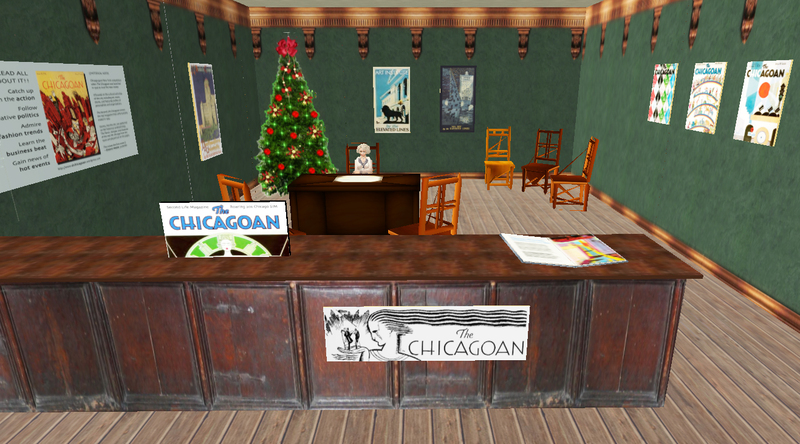 The virtual office for the Chicagoan demonstrates a simple strategy for signage and placements. Integrating into the historic setting, conveying the spirit of the original magazine, and making the location easy to find all work effectively for this now popular hangout for tea and conversation. The counter identifier is for the complimentary classified section. * a role play simulation creates a historic setting and the residents assume various roles and then act the parts. The Chicago Roaring 20s sim has over 500 members with dozens active at any given time. The recreation assumes the form of a real city, but in a fictional environment. 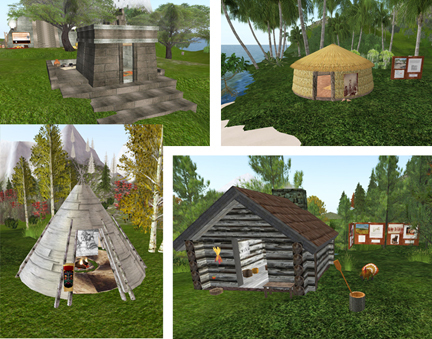 ** inworld publications are virtual books that avatars interact with like print books–turning pages, housing on shelves, etc. They can easily have a real world tie-in equivalent and vice versa. Kiosks around the sim display for distribution. It is rare to be dazzled by a visual presentation when you’ve seen and reviewed as much design as I have. Always searching for gems motivates me to continue my quest for finding design that works—not just attractive, but compelling, intriguing, and impactful. So impressed am I with Virtual Native Lands that I halt in my tracks. Although I have completed my tour of the next 24 nonprofit presentations (begun in my post “Second Life: A First Glance at Nonprofit Graphics),” this presentation stands such head and shoulders above anything I’ve seen in the nonprofit arena to far—now with a total of over 50 visited out of the 80 in Second Life. Entrance signs and map of three islands—representations of North America, Central America, and South America. Not only do their signs have good placement, Virtual Native Lands’ logo is crisp and identifiable. All logos in Second Life are wise to be bold and simple. For a nonprofit group representing native American populations, however, this symbol does need some explanation or it risks of looking too corporate. Information signs explain terrain and act as a portal from the organization's virtual office. “Virtual Native Lands promotes the use of virtual worlds technology to strengthen and sustan real world Native American communities. Although I have yet to take the formal tour that they offer, I dropped in the island at my location, the North American Midwest. There I landed in a grove of trees but could see a log cabin nearby. The indigenous cabins from various regions and tribes allow the visitor to enter, walk around, and explore. Information signs near by give details about the history. Wandering throughout the entire site, I learned about the dwellings, both inside and out, of all the indiginous populations on the two continents! As an educational/historical tool, VNL showcases some of the best features SL has to offer! 2. Legibility is poor. Fully 1/2 of all the signs are difficult to read. Because the point of a sign is to be read, such oversight is hard to understand. Editing can be difficult for anyone wishing to tell a story. But the rules of visual seduction, brevity, and even composition are still necessary. Residents put hours of work into avatars to represent them with sophistication, yet make presentations that are difficult to comprehend! It makes me wonder both why they are there and what kinds of responses they have garnered. This is not to say that compelling signs will guarantee that marketing goals will be met, but there is a certainty that meeting them will be more difficult if communications are unsatisfying. 3. Images are crude. 3/4 use images from logos to illustrations to photographs. But unfortunately, less than half of those look amateurish. (If I investigate the websites of the same organizations, I wonder if I will find the same thing?) The best use the organizational logo, furthering identity recognition. 4. Poor informations signs. Those groups that have signs inside their spaces either overwhelm the visitor with too much or underwhelm with vague content. Most have publication offerings, links to websites and blogs, and videos of activities. How these are presented seems more of an after-thought rather than as strategic tools. 5. The honeymoon is over. Two organizations are gone. The others discuss concerns in the Friday morning conference. Having attended, it is a challenge are to be taken seriously in the business community. The novelty has worn off and expectations altered. Second Life’s role is now being defined for fundraising, presentations, education, and publications. It is a more direct form of communication with members that the belief in its future holds strong. But the idea of foot traffic is dashed. Instead, being event driven, what you put in is what you get out; it is no panacea. AAUW displays corporate approach to signage. AAUW (American Association of University Women) hits all the bases with outside and inside signage. Although not very imaginative, their communication is clear, crisp, identifiable and inspiring. Kiva.org has signs that always provide orientation. 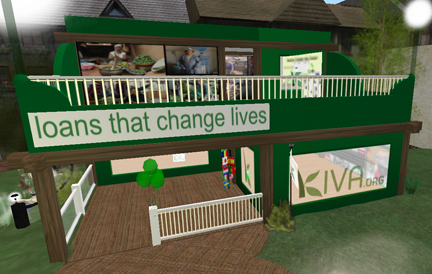 KIVA: Loans that Change Lives demonstrates a corporate design approach very effectively. Every view reinforces their identity and the viewer is never lost. Project Jason expresses their mission visually. PROJECT JASON: Assistance for Families of the Missing has a mysterious name so graphics become even more important to communicate mission. Very compelling in their portrayal of finding missing children, the visitor gets swept into awareness. The more a viewer becomes engaged during a visit, the more inclined he or she is to drop a donation in the tip jar on the way out. The fundraising aspect of Second Life has only begun to be tapped. A much wider-reaching audience can augment the real life performance of these organizations. Graphics have a major role to play in compelling that audience to action. Perhaps the best part of electronic publishing is the ability to change quickly. Yet once a commitmnent is made, it is usually a bad idea to redirect midstream. The test of a strong concept is the flexibility to expand or shrink, choose related forks in the road, or redefine parameters—and still carry out the original goal. When I embarked on this Sebastian Study a few years ago, I envisioned a national study of nonprofit graphics—illuminating the best and those that could be great but aren’t. I have a large developed database containing 1500 nonprofits—the largest organizations based in the U.S. Breaking down this mountain of analysis after my initial categorization (viewing 1500 websites took over two years), I chose to focus just on the Midwest (half of the total) first. Then I would follow up with the national evalutation. However, this planning was before I joined Second Life. I have no choice but to set aside the national version in favor of reviewing the 80 international organizations with presence in Second Life. Last Friday, I attended their weekly meeting, and there were 50 avatars who showed up. Concerns discussed are real life concerns—they complain about the business perceptions that inhibit the acceptance of virtual business—the same tune sung by every new medium. But different than any other media, virtual reality brings all of the others together. Plus it is truly an international marketplace. I was surprised to learn that only 40% out of the 2 million avatars come from the U.S. Jumping past the planned national study, I am going right to one that is international! Super-excited about the possibilities, I see virtual reality as the next evolution of not only communication, but of commerce. There are many bridges to cross before virtual reality really penetrates everyday business exchange. I hope to do my part in making sense of it. 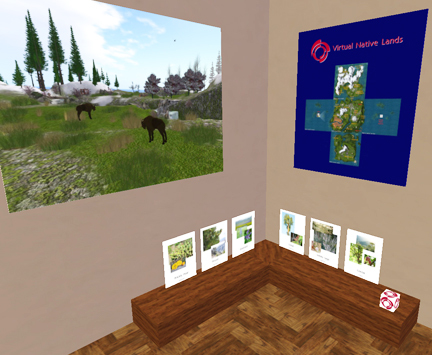 I just added a new page and category to this blog for the upcoming evaluations: “Virtual Reality: Birth of a New Evo(revo)lution.” Here, I outline the current uses of Second Life and how organizations are adapting. Back in 1983, I felt this same way about desktop publishing—and paid dearly to be on the bleeding edge. Then in 1994, I knew that the internet would not only take over my world, but the world of all businesses! Then, with the development of web 2.0 over ten years ago, I knew that connectivity, forums, blogs, and social media would transform communication and business practices. And now, I feel most srongly about virtual reality. As it becomes harder to get people away from their computers, it has become easier to engage them online! With growing virtual eperience, I begin the next phase of this blog to embrace a new frontier. Watch how I mold and expand… and help others navigate the terrain. Look for me wandering about the Nonprofit Commons, wearing a cute hounds-tooth suit with long blond hair! The Sebastian Study: Midwest Nonprofits is completed in this blog. If you wish to know if your organization was considered, please visit www.wofw.com and contact me; I will be happy to share the review ranking with you. 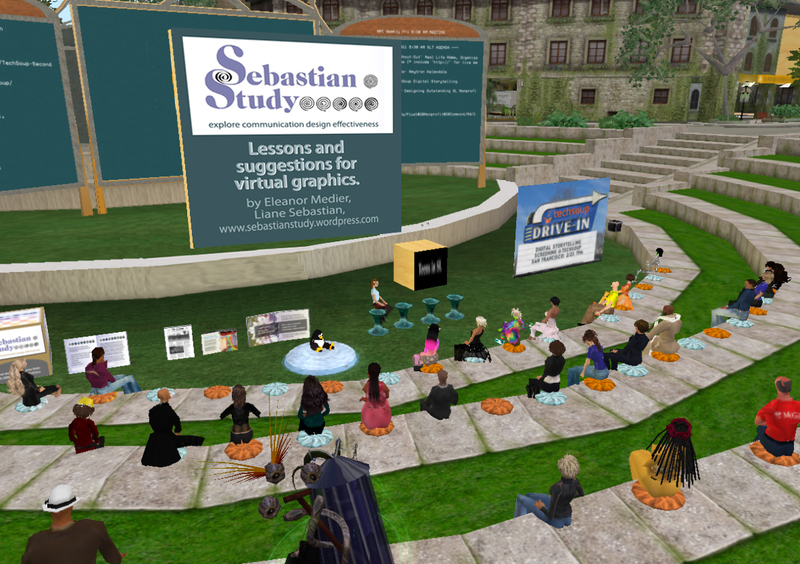 The Sebastian Study: Second Life Nonprofits now begins, so watch for reviews, overviews, and experiences shared in upcoming posts. The ten best presentations will be analyzed, the almost-greats critiqued, and new conclusions drawn to help evolve effectiveness. Although Second Life is now about five years old, the jury is out on its penetration and impact. As a new platform, I am now examining its 80 resident nonprofit organizations. It also opens this Study up more into the national arena. Second Life is at a crisis point. The early enthusiasts are exhausted and impatient with its acceptance level. New users easily get frustrated and overwhelmed. Yet Nonprofit Commons (acting as an information portal) receives over 1600 visitors a month. 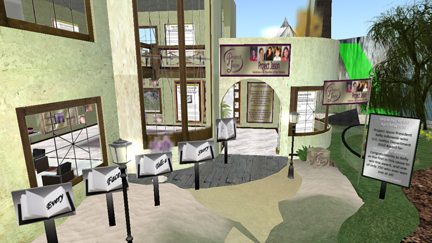 Second Life combines websites, blogs, publications, video, social media, and resources all in one place with the added feature of fun. Such great functionality means the interface has a high learning-curve that the world’s designers prioritize as their greatest challenge to solve. 1. Development is inexpensive. Granted, development is time-consuming, but it is free to register and partake of activities. 2. A donation system allows organizations a vehicle for increasing revenue. A virtual bank handles transactions and can translate SL money into RL (real life) money. Showing how revenue is used is easier than in any other media. 3. Travel is possible both in time and in space. Historical simulations (sims) allow creative and meaningful settings. Shared experiences as tours and in imaginative settings add to the overall enjoyment of participation. 4. Ambient experience of prospects and members can be magnified exponentially. Because all other media feed in and influence presentation and graphics, the user interaction gives an unparalled access to serving them. Libraries have staff that can help the “newbies” get set up and situated—individually and with a high level of customer service. Docents conduct tours, give lectures, run discussion groups, and teach classes. 5. Education is exploding. Discussion groups and classes are growing and cover everything from learning software to support groups to expeditions to exhibitions. Pioneering universities ave curricula and events with a greater geographic reach than real life (RL) venue. 6. Everyone is appealing. Because the user creates an avatar, it is pure self-expression. Second Life’s status report indicates that it isn’t a place to create a fantasy as much as it is an idealized sense of self. For example, I am a younger and thinner version of myself, dress a little more adventurously, and always have clean clothes! The people that I meet often post their RL photo and their avatar tends to be a slightly more fanciful depiction of themselves—demonstrating individualized taste when practicality isn’t an issue. 7. Real money can be made. Donations to organizations are real. Bookstores can offer presentations and events that can attract a national audience versus a regional one, without a cost for travel. Artwork can be shown in low-resolution and sold to be shipped. Memberships can be signed with growing customization. 8. New ideas can be tested before investing resources. An event can evaluate interest levels, surveys can reach a known constituency, and niches can best target. If there are several ideas, variations are easy to niche. 9. Accessible for discovering who is doing what. There is an endless amount of resources, tutorials, instructions, and self-seminars. Then, those who authored these resources can be reached easily and they are surprisingly helpful! 10. All the graphics needed in RL are necessary, plus there are new design components required. Now, organizations actually have a PLACE that is a room or a building. Architecture and interior design becomes necessary on an entirely new level. Posters, instructions, and information presentations also possess new dimensions. Blogs and wikis can be more useful as they augment a major presentation versus carry the information load themselves. 11. Second Life is not the only virtual realty world. There is growing competition. How these platforms complement and integrate versus dilute and complicate remains to be seen. They will probably shake out to niche audiences which would be a shame, for it inhibits the rich cross-disciplinary cultivation happening now. My friends are a teacher in Arizona, professor in Boston, nurse in San Diego, and artist in Phoenix. 12. Mistakes and typos are tolerated. Everyone interacts spontaneously. Information goes up and down quickly. There is a Second Life pace that, like RL, is organic and unpredictable. 13. Brevity is necessary. Those with writing skills have an advantage. But all users must learn to convey ideas in small chunks. Two sentence responses in a chat are the limit to have a good exchange. 14. Presentations can be more polished. As with a website, it is easy to correct, constantly changing, and never finished. 15. It needs to be staffed. Beyond a webmaster, a docent is a tool to welcome, answer questions, and guide. Newbies have a new friend and are easier to pull in than through a piece of literature or a video. 16. Social media has a greater potential for commonalitiy and understanding. For each person met, his or her name is obvious (virtual version of wearing a name tag) and a profile can be reviewed. Public forum are often filled with those hanging out wasting time (not serious potential members or colleagues), so those who get the most from the platform learn to avoid “info hubs.” Many are doing business and not interested in building a social life. Conversely, most users are interested in making friends to compare notes, travel with, and get to know in a completely safe and unthreatening setting. 17. Communication takes on new dimensions: while there is a public chat forum going on, there can be private side-conversations at the same time. This offers a way to personally attend to each attendee or visitor question while addressing the group at the same time. 18. Involvement can be easily phased—from having a sign or a kiosk of links, to running discussion groups, to holding events (of any scope), to renting a storefront, to hosting an entire island, the possibilities are greater than in RL where physical barriers slow down or limit accessibility. All users begin by being a visitor, discover a new pace to interactions, and develop a personal purpose. 19. A new discipline becomes necessary. Second Life is seductive. Wasting time flying around the Roman Forum is too much fun! The busiest time is in the evening when users all over the country are winding down their work days. So late nights having conversations with fascinating people happens frequently. It is especially exciting to meet professional counterparts in other places. So deciding before-hand how much time there is to spend can help. So can a specific Things to Do List as a concrete plan to keep from wandering. 20. Accessibility is redefined. In RL, voice mail and e-mail have added new insulations between people. To cold call in sales is considered spam and inhibits reputations and sales methods. But in SL, contacting anyone is easy. That will have to change, similarly to how blogs are struggling to be responsive as popularity and demand increase (for those that are successful). 21. Collaboration and connection transform competition. Defining niches becomes mandatory. SIM adventures allow organizations to take members on journeys not possible in RL. Those with disabilities can find a more even playing field and new assistance. Those separated physically can still exert significant influence and assistance. Excited about the possibilities, I will embark further on understanding how these pioneering nonprofits are expanding through Second Life opportunities. It requires that I revisit the criteria I have been using for evaluating graphics. Because all the traditional components of logo, banner, site, publications are present, I am excited to learn more about environments, video, and interactivity. 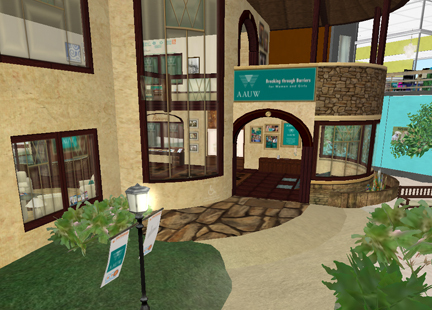 If you wish to find me in Second Life, check out the Nonprofit Commons—I’ll be there a lot for the next few weeks. For the more adventurous, join me in the Chicago Roaring 20s SIM where you’ll find my entrepreneurialism in new expression!